On this episode, Landmark Home and Land Company reviews sorting out if your land and proposed build site are “buildable” and suited to your new home project. Building setbacks, Home Owners Associations, soil tests for septic system and geotechnical reports, height restrictions and topography. Interviewer: Hey everyone. Welcome to another episode of the Panelized Prefab Kit Home Building show. With me as always is the President and Founder of Landmark Home and Land Company, a company which has been helping people build their new homes where they want, exactly as they want across the nation and worldwide since 1993, Steve Tuma. How are you doing Steve? Steve Landmark: Excellent today. How are you doing? Interviewer: Good. Everything is going well. I thought today we might change things up a little bit. We talk a lot about the building process, about panelized prefab homes. I would like to talk about the land itself a little bit, if you’re up for that. Steve Landmark: Yeah. That’s an interesting part because it’s – it’s a huge component of the building process. Where are you going to build? What’s the land like? Is it flat? Is it on the side of the hills in the right school district? Is it close to work? All those variety of details. Interviewer: Well, every home needs to be on a piece of land. So I guess it is important. So just say as a customer, how do I know my land is good for building? I mean what do I need to know? Steve Landmark: Well, that’s an interesting situation because there’s a variety of concerns. First you have to know that it’s legal to build on. It’s zoned right. The setbacks are right and so those – there are details like that for the building department and zoning department. But then there are other details like, “Hey, is it in the right school district? Is it close to whatever you need for your life?” You know, churches, schools, shopping. Maybe you want to be away from all those items and you want to be out in a rural area. So a lot of it is just do you like it. Is it in the place? Does it work? Does it work in the budget? Is it the type of land you’re looking for? Some parts of the country, there’s a lot of land available and other parts it’s very limited, so you have to kind of give and take or work off of what’s available at the time. But the key thing is once you find that piece of land that you like and works for what you want to do is making sure that the zoning is right, that he could build a single family home. You don’t necessarily want to build it in the middle of an industrial complex or something. So you want to make sure that it’s zoned properly for a single family or duplex, if that’s what you’re intending to build. But within there, there are details like building setbacks. You might notice if you go down a neighborhood, you will see that all the – the front of the houses are on the same – kind of the same length. They’re 20 feet back or 30 feet back. If you’re in a rural area, if you’re building on a couple of acres, it might be hard to do that because people might build farther than the setback. But let’s take the example of if you’re building in a city lot, say a lot that’s 50 by 100 feet, just a perfect rectangle. There might be a 20-foot setback in the front. So nothing from the front of your house can be closer than 20 feet to the front lot line. So then if it’s 50 feet wide and you’ve got a 10-foot setback to each side, 10 times 2 is 20, less the 50. That leaves you 30 feet that you can build on. Say the setback in the back is 20 feet. So you’ve got 20 feet in the front, 20 feet in the back, 40 feet total. Less the 100-foot depth of the lot is 60 feet that you can have. So in that particular situation, you can have a home up to 30 by 60 feet, so that it fits within the building footprint, the building envelope. Now to add complexity to do that, sometimes some communities will say, “Hey, you can only have a 30 percent lot coverage.” They don’t want your lot covering corner to corner. They want to have some green space, spaces for yards, space for kids to play. Just visually appealing situations. So that’s a situation that you just want to make sure that the house that you want to build is on there. If you want to – if you’re in the city and you’ve got a 50 by 100 lot, you’re not likely to be able to build a 50-foot wide house on there. Steve Landmark: Now we can work with you to make that lot usable. You know, come up with a different design and make sure that it works out. So those are the big issues are the building setbacks, to make sure that it works. So that your house can fit on there. Make sure there’s space for driveways, sidewalks, garages, different little areas. That’s the important part is just make sure that it fits for the regulations like the zoning. Now there are also situations where you’ve got to look at land and – you know, is it sloped or flat? You know, in different situations like that to make sure that the house fits because if you want a house on a – let’s say on the side of a hill, you might be able to work a walkout basement into it. You know, in some areas, the land – you know, if you go into the southwest, people are typically more building on slabs. So there’s a lot of details that we can help you look into to make sure that the house fits the regulations for the land, but also just makes sense to be on the land. So that’s something that a lot of people should take a look at and a lot of places with mountains where people want to protect views and do different stuff. There might be height restrictions. So if you’re an area – a lot of places in Colorado and California will have this where they don’t want you to build a house so tall that your neighborhood can’t take advantage of the view. Steve Landmark: So what’s interesting about these, a lot of people say, “Oh, these regulations, it’s just hard. It’s hard. How do I know?” Well, a lot of these are there to maintain the value of your – the community and therefore your home. You know, if it’s a properly planned community, the housing stack looks good. The community feels good. It’s going to be more inviting for someone who wants to buy your home, when it comes to the time that you need to sell it. Interviewer: It’s funny. You said, you know, you’ve got to make sure your design makes sense for your plot of land. What is that process? How can I be sure that my design, my home will fit on the land? I mean people have been telling me. I’ve been hearing about setbacks and things like that. But how do I know my design will actually fit where I want to build? Steve Landmark: Well, that’s something that we can help you at Landmark. We can go through and if you have an idea, you say, “Hey, I’m buying this land and here are the dimensions.” We could check the setbacks. We could check the zoning. We could check different regulations, the lot coverage and all those things. So it’s not something where you can just go out there and there’s a quick one, two, three question. Sometimes you got to look at the design of your home. Because even though someone can say the lot is buildable, is it buildable for the house that you choose to build? Because I think where we become concerned and want to make sure that it works together because like that example of the house that I told you, the lot we just discussed, the 50 by 100 lot, where you would have a buildable footprint of 30 by 60. If you said, “Hey, I want a garage to the side of my house,” and the house is 20 feet wide, well, of the 30-foot width you have available, that leaves you a 10-foot wide house. You would have to figure a particular design to make that work or maybe you’ve got to go with a two-story home. So that overall planning is something that we can help you with and we’ve got the experience and we can do site plans, get details worked out so that it goes through. Oddly enough, there are general rules of thumb that can work. But we’ve had some building departments that say the setback is to the edge of your house. Other say it’s to the edge of the overhang at your house. Then others have said if you have gutters on your house, it goes to the edge of the gutter, how far it is protruding. Steve Landmark: And then if you end up in other situations – like we’ve got some projects in Lake Tahoe where you can have a house the second level overhang. It could cantilever. Beyond the setback is if it was on the ground. So that example that I told you of a 30 by 60 house, you could cantilever to the front, giving a bigger footprint on the second level. So sometimes these regulations, community by community or subdivision by subdivision, can change and they can get a little intricate and we can help out. That’s part of the site plan work and properly designing your home to make sure that you’ve got a set of plans that are good for you to submit for permits. Interviewer: Now, I’ve heard and read that I may need soil testing on my – you know, before I can even build. One for my – I guess my septic system and one for construction. So explain the difference. I mean what are they? So we will break it in general for the specifics. If your house is in a septic system, they will need a test. Old times call it percolation, perc test, where they drop water in the hole and see how long it takes to drop. Well, they found out that’s not always accurate because of seasonable water tables. So they actually take a boring on the soil and test it and get an idea of the makeup of the soil to know how water will transfer through it for the purpose of a septic. So if you take clay, Steve, if you’ve ever been in a clay field, you could drop water on it and it will puddle there. It could take a long time for it to seep through. But if you’re on a beach and you spill the water, it seems to be instantly gone in the sand. Steve Landmark: So different soils have different capabilities for transferring the fluid, which then would – they kind of reverse design it to figure out how big your septic field is and go back to see how much space that you need. So that septic test is very important or the soil test for the septic is very important to make sure that your septic system is properly designed. Now for construction, there are two others. A geotechnical report and a geological report. The geological report tells the makeup of the soil, of the ground below you, what type of rocks, what type of this, what’s happening. It’s not that often that those are requested unless you’re like on a fault line or something on the West Coast. The one that’s more typically requested is a geotechnical report and that basically tells you the strengths of the soils. So for simple purpose, everyone has probably walked on a rock, a big piece of granite in a mountain or somewhere. That’s extremely strong. OK? But if you took that same person and you put them say at the edge of a pond, where there’s muck, a regular person will sink just standing there. So there are obviously different strengths to those soils. So – and the muckier soil, you’re going to sink. So that’s a weaker soil. Something like granite which is literally rock solid, you’re not going to sink. It has got a stronger strength. So the geotechnical report takes a boring on the soil to find the strength of your soils. Now a lot of people will say, “Hey, I drove my truck on there and it didn’t sink at all.” Well, that’s probably true. But what’s going on two feet down, three feet down? When you have a house sitting on it, what’s going on? So the geotechnical report tells the strengths of the soil, so that a structural engineer can make sure that their weight is properly supported for your new home. Now here’s the trick. A lot of places, the building department says, “Hey, you need a geotechnical report.” They will be like, “What’s that?” They don’t ask for it a lot. Generally where it’s really, really requested is places with mountains or varied soils, expansive soils. Some soils in different conditions can expand and heave a basement floor or heave a foundation. So generally, where those are more requested are places where you need the engineer-stamped plans. Hurricane areas, earthquake areas, high snow load areas, expansive soil areas. So you’ve – it’s an interesting situation because a lot of people call their building department and they will be like, “No, you don’t need a geotechnical report.” Well then later to find out that if there’s a problem with the soil conditions, they do because they need to verify what’s there. So I consider a geotechnical report to be a pretty important situation if you’re in an area where you’ve got varied soils and you’re not sure of the strength of the soils and it’s also for landslide situations if you’re in mountain ranges and things like that. So generally, your building department will request one if it’s an area that has any of these conditions where it’s important to have it. I always kind of tell people, “Hey, if your building department says hey, you might need it, I would say get it.” You know, for the cost of the geotechnical report, it’s – I don’t want to call it insurance but it’s kind of a good – it allows you to sleep at night knowing that your foundation is designed properly. The foundation supports the house. Interviewer: It makes sense. I would like to talk a little bit about homeowners’ associations, if you don’t mind. If I’m coming into a situation where I don’t know anybody there. I’m building a house in a certain area and they have an Home Owners Association or Architectural Review Board. What’s the best way to – how do I best work with the homeowner’s association before I start building? Steve Landmark: Well, homeowners’ associations generally – if they’re active, it’s recorded with your deed. So when you purchase the land, you should get a copy of the homeowner’s association requirements. Sometimes they’re very simple. Other times, they’re extremely intricate. We talked about setbacks a little earlier. The city or county may have minimal setbacks but the homeowner’s association may have setbacks that are even more restrictive. Steve Landmark: They may not say no modulars but you can’t truck two halves of a house in or whatever. There might be restrictions there on how and what you could build. Generally, they’re pretty cooperative groups. They’re just wanting to make sure that the community is built to a certain standard. Some are very informal. Sometimes it’s just the owner. You call him up. You give him your plans. Sit down. Have a cup of coffee with him and he signs it or makes adjustments. Other times, they’re more formal where there’s a meeting once a month and you’ve got to prepare and communicate with them what’s going on and show samples of the finishes and colors. The key to it is no matter what the homeowner’s association requests, we can go through, put the details on the plans and make sure that you’re prepared for it. So that you could present them the proper set of plans and then they can move on to approve it. Interviewer: We touched earlier on the height restrictions. How often does a homeowner run into that kind of thing or where they want to build? Is that like pretty common? Steve Landmark: That’s great you brought that up because there are also restrictions, the physical restrictions on where it makes sense to build. Steve Landmark: You know, the types of materials. So in a lot of places, they will do that. Sometimes there are restrictions because of something going on a community like an airport. Other times, it’s to allow visibility. Other times, it’s just to keep a certain look in the community so that it’s a certain style of home. So – and then there are other portions where wood homes generally go three, four stories. So if someone wants to build an eight-story home, you might have to get the different types of construction methods. But the height restrictions are kind of interesting. A lot of people go through and say, “Oh, they just don’t want me to build a tall home.” Some of these communities, they will go through and have height restrictions with some pretty intricate calculations to make sure that the sun can come into the community. Steve Landmark: OK. So all of us have been in say old towns or city centers where they have these row houses that are just stacked. No light comes in. Steve Landmark: You don’t get light in your backyard or your front yard or the front porch or in your window. That can affect people. So a lot of these height restrictions also dictate how you calculate the height, so that sunlight can get over and around through your house, into your yard, and also allow sun into your neighbor’s yard. Interviewer: I never even thought about that. Steve Landmark: It’s a great thing that you brought up again because it’s a pretty deep subject. Originally it’s just – it sounds simple. Hey, you don’t want to block your neighbor’s view or hey, they don’t want 100-foot houses in a community ranch home. You know, it just sticks out like a sore thumb. But it’s for breezes. It’s for sunlight and I think all of us will agree it’s nice to have a sunny yard. It’s nice to get sun in your – into your windows. It’s nice to get a breeze into your windows. Interviewer: Right. So you see it as a deep subject or could be a tall tale. So one other thing I would like to hit on. I hope you don’t mind and before you go is, is it harder to build on a slope piece of land? Because I was looking at a piece of land that had kind of a slant to it. But overall, how does the topography affect my home design? Steve Landmark: Well, it’s pretty interesting. The simple answers, if you have a flat home – or I’m sorry, a flat house, it’s just easier to access the land. It’s easier to put a foundation in. There really aren’t chances of landslide. Chances are it’s more of a stable type of a ground. So it’s generally easier to build on a flat piece of land. But what’s happening is a lot of people live in mountain areas or different areas where there are hills. They want to take advantage of land. So the slope piece of land presents opportunities for walk-out basements, different views, different home designs. But in general, yeah, if you’re building on a hill, it might cost a little more just because the physical location of building on a hill, but also the foundation design that has to go into it. So I will wrap in – you know, a couple of minutes ago, we were talking about geotechnical reports. Hills can have a variety of different makeup of the soils within them. They could be granite. They could be soft soils. They could be whole different types of situations. They could be expansive soils. There could be hydrostatic forces from water, different situations. So they can – flat land can do the same thing. But on the side of a hill, you just get into more intricate situations on stepping foundations. So Steve, let’s just take the example of if you were to build a ranch home in a flat field. You could just excavate for a slab, a crawlspace or a basement. If you did it on the side of a hill, took that exact same house, you had a walkout basement, you would have to design the foundation to step out of the side of the hill to make that work. Also on hills, you might have different situations on where you can put septics if you’re in an area that requires septics. So there is a little more complexity to it. But on the other side, some of these can be stunning homes with stunning views that are really, really, really neat homes. So to design on the side of a hill, there’s a difference. If you’re like in Southern Indiana or Kentucky, that hill is one thing. Then you go to the Rockies or the Sierras. That’s a mountain. Steve Landmark: So there’s a different concept in the slope. But basically we can work on all those. Just get some topographical details which will show the topography of the land. Is it flat? Is there a hill? Is it flat on one part with a hill or a mountain on the other? Then we figure out the best place to build a house into the land. Steve Landmark: For the particular person’s use. So a lot of this really depends on your lifestyle, what you choose to do and your availability of land. Interviewer: Sweet. Well, that’s going to about do it for this episode of the Panelized Prefab Kit Home Building Show. Steve, if you don’t mind, give us the info on how one would contact you with Landmark Home and Land Company. Steve Landmark: The best way to contact us is just you can take a look at our website. It’s www.LHLC.com. Kind of like the initials of Landmark Home Land Company, so www.LHLC.com. You could always call us at 800-830-9788. We’re also on Facebook, Instagram, Pinterest. You can find us there but we’re accessible. We enjoy talking to people, reviewing their project. I kind of call it doing your homework upfront. Find out who our customer is. They can find out about us and we can kind of have a preliminary conversation to see how we can help them. Interviewer: All sounds great to me. 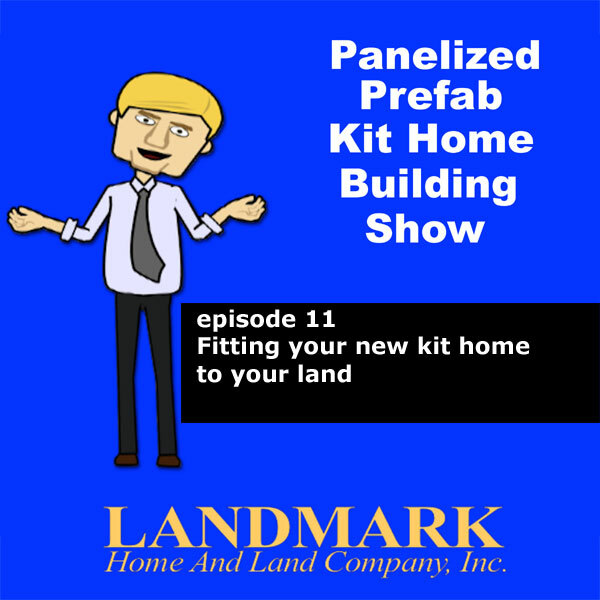 Well, thank you once again everyone for joining us for the Panelized Prefab Kit Home Building Show and for the President and Founder of Landmark Home and Land Company Steve Tuma and myself, thanks for joining us and we will see you next time.